Corina is a Karen refugee who lives in Mae-la camp. She directs the Zone A No 3 preschool located in the Anglican sector of the camp. Corina has 5 teachers and seventy five children in her preschool but her influence goes far wider than just Zone A of Mae-la camp. Corina oversees 23 preschools at Mae-la and offers training and mentoring to over 115 preschool teachers in the camp as well as preschools in Karen state (in Burma) as well as surrounding Thai villages. Corina’s life is effecting many thousands of children both inside and outside of Mae-la camp; her Burmese language preschool program is used in all refugee camps inside Thailand. 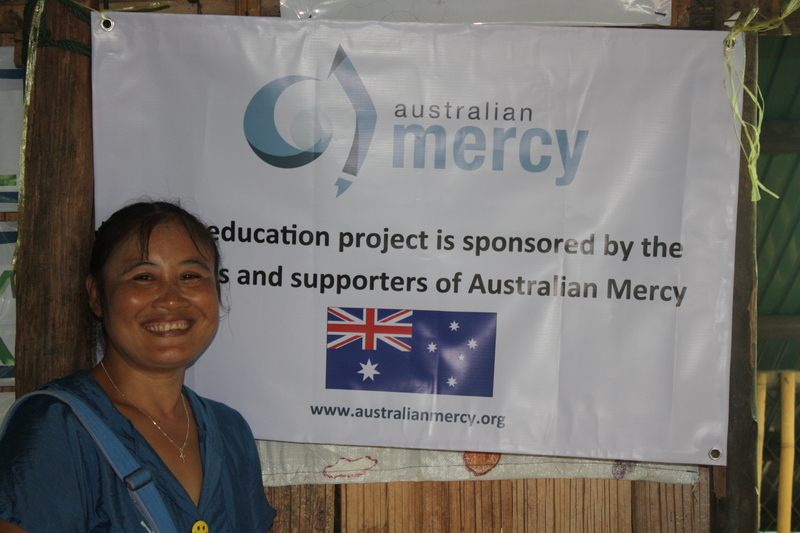 Australian Mercy has supported Corina’s work for many years, but we need more help. We need to raise more money for the Zone A preschool to help cover its’s running costs and we need to further funds Corina’s mentoring program. Running the preschool in wages and resources costs $500 per month. The extension work costs a further $100 per month, renovation and maintenance cost come to a further $50 per month. On top of this Corina provides a midday meal for each child which comes to $1.00 per child per day at a cost of $1500 per month. With the current income we have for this project we have enough to cover these costs for four months of the year. We need to find people like you who can regularly give towards this project on a monthly basis. One off gifts are very welcome but in order meet the basic requirements of this preschool we need to see increased regular giving. Our project need is $2,150 per calendar month, or $25,800 per year. Currently we we receiving $8,600 per year. Your monthly commitment to this project will help to make a significant difference in the lives of literally thousands of refugee children who are living in poverty, who through Corina and her team are receiving a quality preschool education. Will you help us to make a difference to theses children? Tax deductible donations can be made through our secure site. Just select from Karen Preschool Project the donation target menu. Donors from the US and Canada requiring tax deductibility should click on the flags for instructions. The preschool project page can be found here.